The project is composed of 2 parts;1st part is the workshop period, which is an experimental studio work with artists from various backgrounds (selected by Apartment Project) in interaction with the local artists, writers and curators. 2nd part is the residency period. 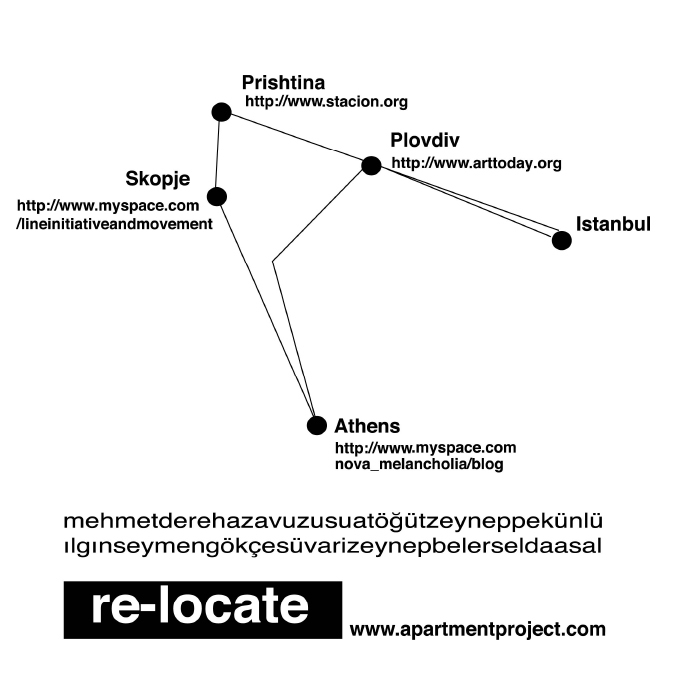 Apartment Project will host 4 artists from each of the partner organizations for a residency period of one month in Istanbul. After the workshop and the residency, Re-locate project will be concluded with an exhibition in Istanbul. A catalogue composed of the artists’ works; their interactions and the documentation of the process will be published and introduced in conjunction with the exhibition. May 9th 2011 Monday (evening); Bus trip from Istanbul to Plovdiv. May 10th 2011 Tuesday; Arrival in Plovdiv.